I read about this in the newspaper, and the article said that the people conducting the survey think people cheat more often nowadays because we are so much more stressed. I believe it! The survey results don't surprise me. And the fact that are they being honest whilst participating in the survey? Psaw! Bad, bad bad. Not good AT ALL. Oh, yeah, we're all a bunch of criminals. (I bet the people who did the survey did each of those things when they were kids) But what about The Rebelution? I think its depressing that adults really think that kids are just little criminals. My dad saw that survey in the paper and was freaking out and basically said that us kids are just evil and that adults give us to much independence. I would never think of stealing anything... in real life. I have thought about mastermind heists on a few occasions, but only for books. I plan to write two or three series about teenage spies. OK, I admit it. I'm a hardened criminal. I shoplift, deal drugs, cheat, vandalize, forge signatures, rob banks, burglarize houses,joyride in stolen cars, and lie about it on surveys. When I get too bored, I stalk and kill random strangers and stash the bodies in my closet. I can't help it! I'm a teenager! Aaaaah! Maybe some people were lying about lying on the survey?... lo :D or maybe they took it anonymously? Meredith: I totally agree with you. Okay, shoplifting, maybe not everyone does it - it's actually a real crime, a bad one. But cheating in tests? Almost everyone I know does it! I think after you cross any line in regards to the law you've crossed it. Maybe they would have gotten different results if they surveyed different people. How do they know those results were out of the ordinary, anyway? Maybe the people who lied said that they HAD stolen something/cheated/lied to save money. You never know. I have heard of this survey before and even filled one out once in high school. It is possibly the most useless and least reliable survey I have ever seen. Nellie: I do cheat. Whether it's giving answers to another person, or getting them from another person, I'm being honest, I do cheat. But not always of course. Just in desperate situations. Leave it to adults to be boring and call us criminals. I mean, really, the correct term is "scam artists"
OK, so if some of the people lied while taking the survey, the results are bogus. End of story. Not to mention, if there are 26% who lied, wouldn't that mean that there would be more who lied about lying? Making the survey even more bogus! Adults these days think we are all a bunch of criminals. Which is totally wrong, they're is no reason kids now would lie/cheat/etc more then kids in the 80's or whatever. Not to mention they say we are criminals, then go off and talk about not being bias. I mean, honestly. I've never stolen any thing from a store. 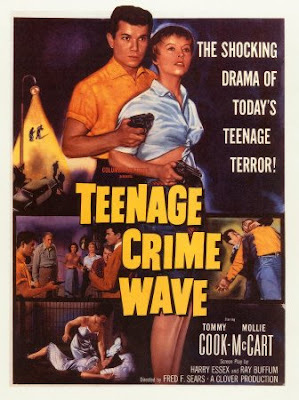 Teenage Crimewave. Believe it or not I have seen that movie. It was without a doubt the worst movie I have ever seen. Next to Plan 9 from Outer Space, that is.